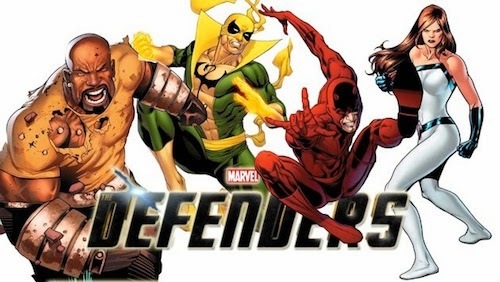 Joe Quesada (Chief Creative Officer of Marvel Entertainment) has confirmed Marvel's upcoming Netflix series is connected to the Marvel Cinematic Universe and will be available to binge-view from day-one. "There will be some interconnectivity, much like the movies. They will exist within the Cinematic Universe again, so this is all the same world as S.H.I.E.L.D. and The Avengers… Although these are superhero stories, this is different now. This is the street level… this is the street level noir side of the Marvel Universe. Something that you haven’t really, really seen in any of our Marvel movies. And probably more ground level, than I think you’ve seen. This is not like us doing Batman, Dark Knight or any of that stuff. This is very much Marvel doing street level superheroes." "The scripts are coming in. They are pretty fantastic. They’re really emotional. They’re very, very original. But at the same time, it is Daredevil. It is Matt Murdock. We will eventually, hopefully start casting really, really soon, but I’m very, very excited about it." When Smith asked whether Kingpin would be part of the Daredevil or Spider-Man universe, Quesada remained coy about the villain. “I’m not going to say who the villain is in our story,” answered Quesada. This July Marvel's Netflix series begins shooting in New York for release in 2015. Presumably to tie-in with Avengers: Age of Ultron. DC Comics please take note.